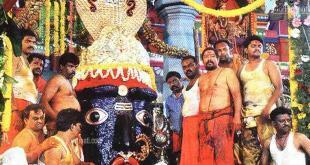 After having head bath, devotee can perform angapradakshinam at this temple. No ticket is required to perform angapradakshinam at this temple. Angapradakshinam can be performed anytime during temple opening hours i.e, 5:30 am – 8:30 pm. There is no restriction with the dress code as well, any decent outfit is allowed. There is no restriction with age as well. Any age is permitted. It is up to their health condition. 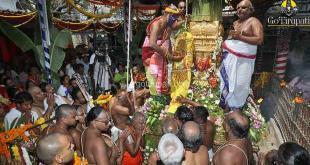 Devotees can have head bath at home and plan to reach temple. There is no restriction on wet clothes. It can be performed with dry clothes. 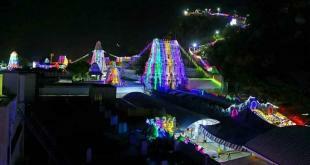 Devotees used to prefer this temple,if they are not able to perform angapradakshinam at Srivari Temple in Tirumala. How to reach Srinivasa mangapuram Temple? Other option, One can get down at Kallur cross , from there temple is 3.9 km away. Buses to Chittoor, Chandragiri, Pakala goes via this Kallur Cross. Chittoor may not allow for boarding as it is short distance. Tiruapti-Chandragiri bus runs with high frequency.